The major subdisciplines of ecology--population ecology, community ecology, ecosystem ecology, and evolutionary ecology--have diverged increasingly in recent decades. What is critically needed today is an integrated, real-world approach to ecology that reflects the interdependency of biodiversity and ecosystem functioning. From Populations to Ecosystems proposes an innovative theoretical synthesis that will enable us to advance our fundamental understanding of ecological systems and help us to respond to todays emerging global ecological crisis. Michel Loreau begins by explaining how the principles of population dynamics and ecosystem functioning can be merged. He then addresses key issues in the study of biodiversity and ecosystems, such as functional complementarity, food webs, stability and complexity, material cycling, and metacommunities. 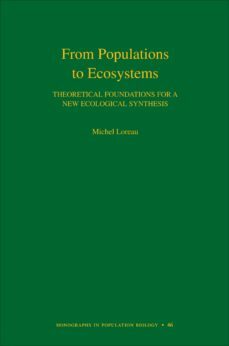 Loreau describes the most recent theoretical advances that link the properties of individual populations to the aggregate properties of communities, and the properties of functional groups or trophic levels to the functioning of whole ecosystems, placing special emphasis on the relationship between biodiversity and ecosystem functioning. Finally, he turns his attention to the controversial issue of the evolution of entire ecosystems and their properties, laying the theoretical foundations for a genuine evolutionary ecosystem ecology.From Populations to Ecosystems points the way to a much-needed synthesis in ecology, one that offers a fuller understanding of ecosystem processes in the natural world.